That’s why choosing a bug reporting process is necessary. There are many different elements you can include in your bug report, but below are some examples of the most important. 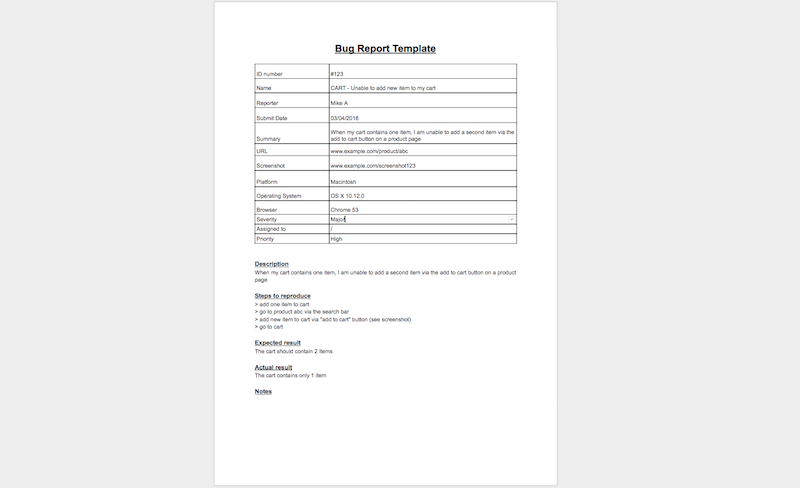 Usually, the bigger your organization, the more detailed your reports need to be. ID/name: Keep it brief and use correct terms. A best practice is to include the name of the feature where you found an issue. A good example could be 'CART - Unable to add new item to my cart'. Description/summary: If you feel the name is not sufficient, explain the bug in a few words. Share it in easy-to-understand language. Keep in mind that your description might be used to search in your bug tracking application, so make sure to use the right words. Environment: Depending on your browser, operating system, zoom level and screen size, websites may behave differently from one environment to another. Make sure your developers know your technical environment. Source URL: Make it easy for your developers spot the problem by including the URL of the page where you found the bug. Big time saver! Visual proof: A picture is worth a thousand words. Although it might not be enough, a visual element like a screenshot or a video will help your developers understand the problem better and faster. Steps to reproduce: A screenshot is a proof that you had a problem, but keep in mind that your developer might not be able to reproduce the bug. Make sure to describe, with as much detail as possible, the steps you took before you encountered the bug. Expected vs. actual results: Explain what results you expected - be as specific as possible. Just saying "the app doesn’t work as expected" is not useful. It's also helpful to describe what you actually experienced. Optional: You can also include extra information such as the severity (critical, major, minor, trivial, enhancement), priority (high, medium, low), name of the reporter, person assigned or a due date. Bugs can be reported in a number of ways. However, using a bug tracker is probably the best way for your organization to move bugs from reported to fixed and help your developers stay focused. A large number of developers use GitHub to build software in teams. 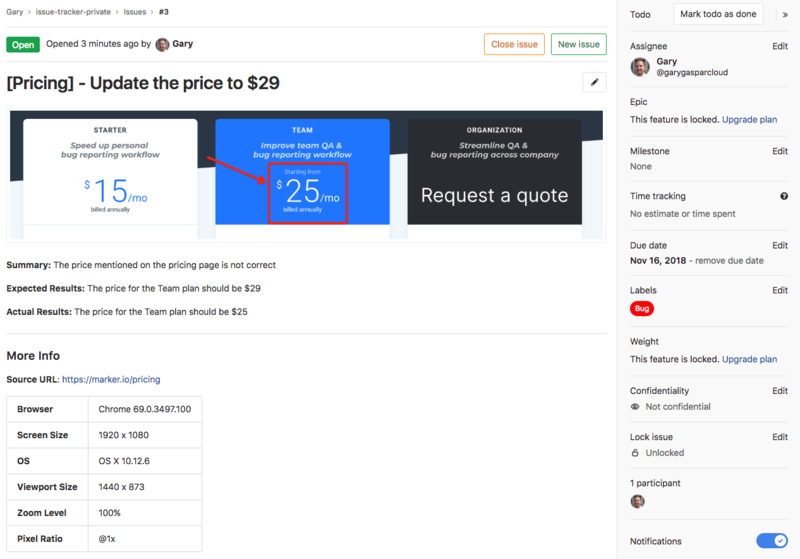 The original goal of GitHub was to help developers collaborate on code, but as the services grew, they added more features and become a project management tool for building software. 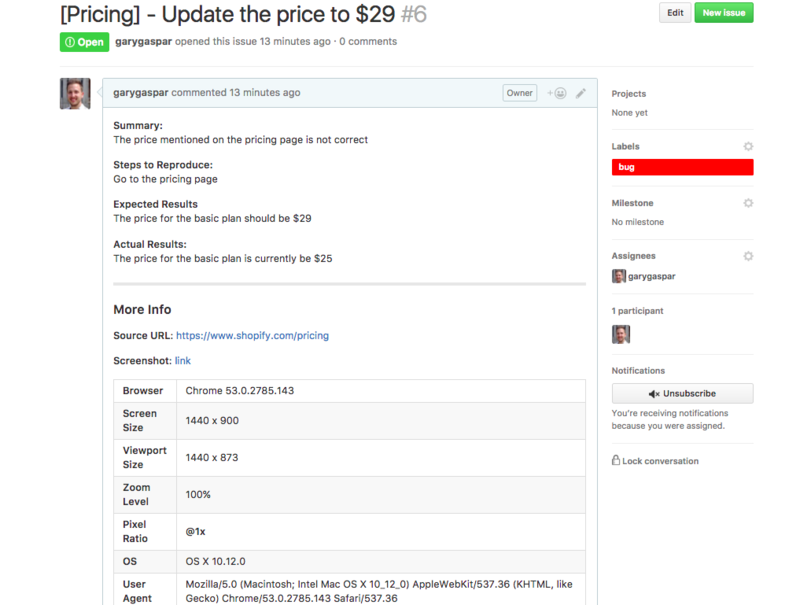 GitHub has an issue tracker built in, which makes it easy for developers to keep track of bugs. As you can imagine, filling out a bug report like this one can take a while. If you need to report dozens of bugs during a testing session, it could take you several hours. Fortunately, you can speed up that process dramatically by using Marker.io for GitHub. Take a screenshot with Marker.io when you spot a problem on your website, add annotations to get your point across and in 1-click the tool will convert it into a GitHub issue. All the important technical information (e.g.browser version, operating system, screen size and zoom level) are automatically embedded into your screenshot and included in your GitHub issue - without you having to do any extra work. You can even use the built-in bug report template before creating your issue and fill out the steps to reproduce the bug, as well as the expected and actual results. If your team is on GitHub, consider signing up for a free Marker.io trial. Jira is a famous issue and project tracking software designed for development teams. It’s a bit complex for small teams, but it's also very powerful - which is why some of the most well-known tech companies in the world use it. I’m not going to review how Jira works, because it’s beyond the scope of this blog post. The important thing to understand is the concept of a Jira issue. In Jira, an issue is a ticket that enters the system. It can be a project task, a Helpdesk ticket or a software bug. Bugs can be reported by anyone in the organization, so it’s important to define a process and a template that everyone can easily use. You can see that all elements of a well-reported bug are present, including: name/ID, summary, visual proof, environment, source URL, steps to reproduce, expected vs. actual results. As you can imagine, filling out a bug report like this one can take a while. If you need to report dozens of bugs during a testing session, it could take you a while. Fortunately, you can speed that process up dramatically by using Marker.io for Jira. Take a screenshot with Marker.io when you spot a problem on your website, add an annotation to get your point across. 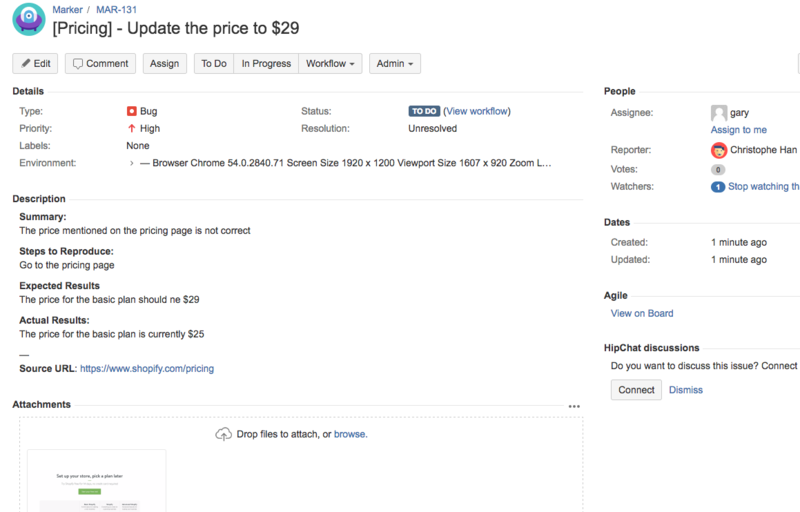 Marker.io will in 1-click convert it into a Jira issue. All the important technical information (e.g.browser version, operating system, screen size and zoom level) are automatically embedded into your screenshot and included in your Jira issue - without you having to do any extra work. If your team is already using Jira, consider signing up for a free Marker.io trial. Trello is a free and super easy-to-use project management tool. Its ease of use is what makes it perfect for both small or medium size organizations. For your bug tracking purposes, simply set up a board called bug tracking. I recommend creating the following lists: reported, accepted, in progress, to be validated, done. You can even use labels to define the importance of your bugs (critical, major, minor, trivial, enhancement). Next, start adding a Trello card for each bug. Side note: I published a post on Trello's blog about managing your bug tracking with Trello. All the elements of a well-reported issue are present, including: name, summary, visual proof, environment, source URL, steps to reproduce, expected vs. actual results. Fortunately, you can speed up that process dramatically by using Marker.io for Trello. Take a screenshot with Marker.io when you spot a problem on your website, add annotations to get your point across and in 1-click the tool will convert it into a Trello card. All the important technical information (e.g.browser version, operating system, screen size and zoom level) are automatically embedded into your screenshot and included in your Trello card without you having to do any extra work. You can even use the built-in bug report template before creating your card and fill out the steps to reproduce the bug, as well as the expected and actual results. If your team is already using Trello, consider signing up for a free Marker.io trial. With the recent acquisition of Github by Microsoft, an increasingly amount of teams are switching to Gitlab to manage the whole DevOps lifecycle in one place. All GitLab projects come with an issue tracker, making bug reporting and issue tracking a breeze. While developers would want all Gitlab bug reports in GitLab to be as detailed as the screenshot above, this can drive reporters crazy! It's just to much info and too many pieces of software. For reporters like clients, users and non technical colleagues, the GitLab interface can definitely be overwhelming. 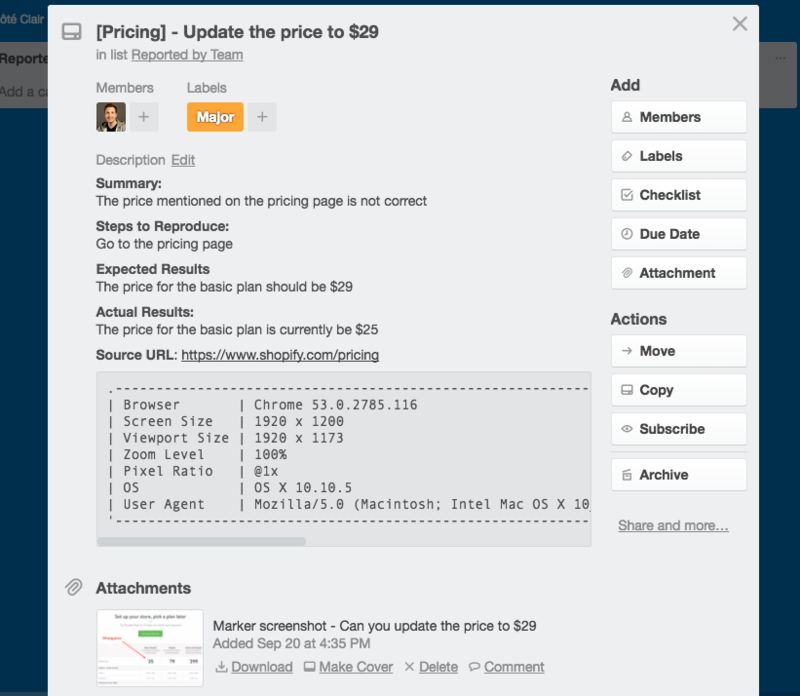 Asana has really become over the years the professional alternative to simpler project management tools like Trello. Although Asana is great for keeping track of tasks, an increasingly amount of teams are also using it as a bug tracker. 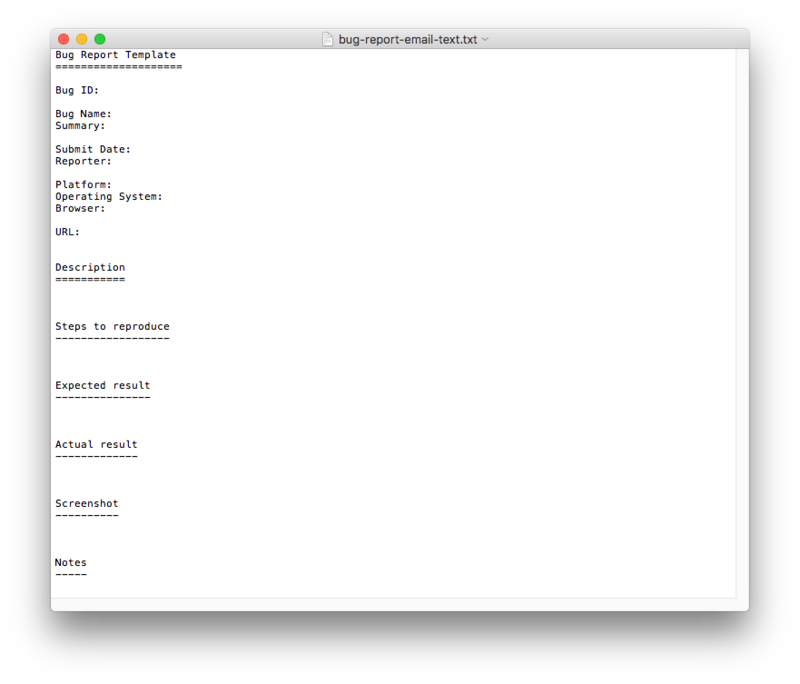 As you can see, all the elements for a great bug reports are all in there! However, creating such a detailed bug report in Asana can be overwhelming for clients, users and non technical colleagues. 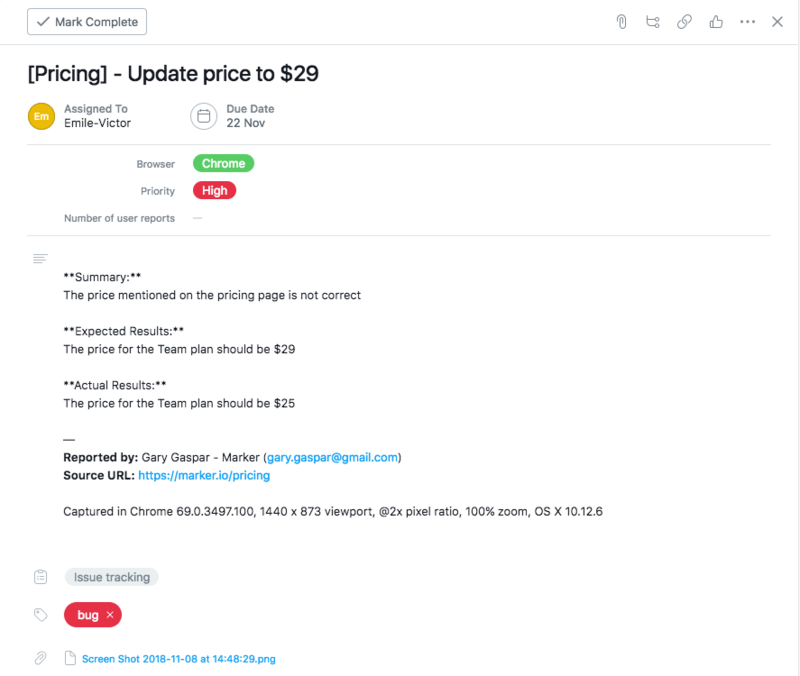 Fortunately, you can speed up that process dramatically by using Marker.io for Asana. Take a screenshot with Marker.io when you spot a problem on your website, add annotations to get your point across and in 1-click the tool will convert it into a Asana task. All the important technical information (e.g.browser version, operating system, screen size and zoom level) are automatically embedded into your screenshot and included in your Asana task without you having to do any extra work. Finally, if you want your reporters to follow a specific bug report template to help structure the bug report into the Asana description, simply switch on the template to have the steps to reproduce the bug, as well as the expected and actual results. 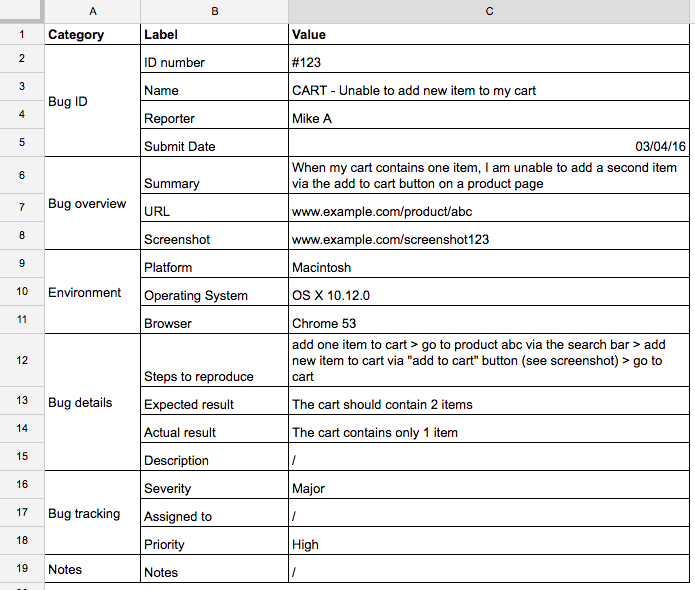 Reporting bugs in a spreadsheet can be a cumbersome process. However, smaller teams can still benefits from this method. If you’re team decided to report and track bugs in Excel, it’s important to define a template that everyone in the organisations agrees to. Although not optimal, reporting bugs in a .doc file can be a fast and structured way to report bugs to technical members on your team. As always, make sure that all necessary information is there. You don’t want your developers to have to come back to you, and ask for more information. Reporting bugs in a PDF file is similar to the previous MS Word document option. PDFs are not very flexible, however it might be a requirement to use them inside your organization. If that’s your case, feel free to copy our template. Most communication is still done through email. For example, if you’re a web agency client but the team didn't give you a structured process to report bugs, you can always send them via email. To ensure your emails always follow the same structure, we recommend saving the email template below for your bug reporting. Copy paste the content in this text file or download the txt file. Web and software testing is tough. A lot of people from different backgrounds and expertise need to give their feedback. Miscommunication can lead to huge delays and growing frustration. By establishing a process for reporting bug based on a fixed template, you can greatly reduce these problems. Are you struggling to decide whether Trello or Jira would help you track projects more effectively?Looking to learn more about each tool so that you pick the best solution for your team? Why can’t bug reporting and issue-tracking be easy? How one web agency built a simple, yet powerful bug reporting and feedback tool that changed their workflow.